As part of my pre-Creative Charity Adventure research I spent a morning with Nicki Smith who runs the Creation Station in Bath. They run creative workshops aimed at nurturing children’s creativity through fun arts and crafts activities with their parents/carers. It was fantastic! We started with the rainbow song and then got stuck in to creating some rainbow paintings. 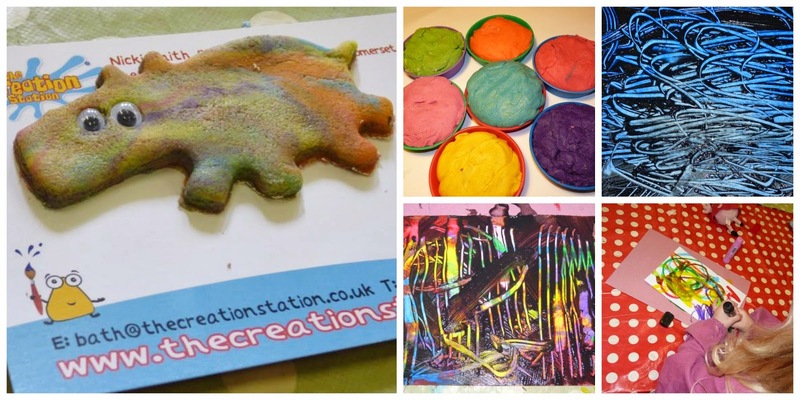 Colourful creations at the creation station, Bath. I LOVE that rainbow hippo! As I don’t have children of my own, it was fascinating watching them really going for it with their painting. They seemed to have no fear and yes there was paint everywhere – even up some of the mum’s arms – which personally I thought was great! Next came the handmade salt dough (recipe at the bottom of this post if you'd like to try making it yourself!) to create some rainbow animals. What a colourful menagerie! All too soon (for me at least) the 50 minute class was over and it was time to clear away. I could quite easily have spent the rest of the day creating rainbow paintings and sculptures! Even though I only spent a morning with them it has certainly given me some ideas for my trip to Thailand in a few weeks time (6 weeks to go!) as well as giving me an appreciation of how short kiddies under 5s attention spans are. I though mine was short! After the class I asked about the business side of things as Nicki recently won Franchisee of the year. I wanted to know what the secret was to running an award winning business. 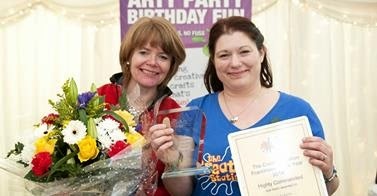 Nicki receiving her Franchisee of the Year 2014 Award from Sarah Cressall, The Creation Stations Founder, and very inspirational woman! "Not giving up," was Nicki’s response. "At the beginning there were occasions when only one person turned up to a class and other times no one. It was really disheartening but I was determined to make it work." And three years on she has. How? By being determined, flexible, pro-active and by experimenting. This business is very different from Nicki’s previous life. Armed with an English degree and being part of the Weatherspoons Management team (Nicki was an award winner there too), Nicki has run million pound businesses with teams working with her and has a wealth of experience, so thought the transfer to running her own business would actually be straightforward. If you have been through a similar change then I’m sure you’ll also know that isn't always the case. There are different challenges to face for a start as you suddenly become the person who does everything. This can take some getting used too!! However, her zesty determination meant that Nicki kept going and learnt the benefits of being flexible. Flexible enough to change things when they weren't working – for example just by changing a venue saw her class grow from 5 children coming to 20 and enlisting the help of an assistant. Something as small as that, but it made a huge difference. Nicki’s success has also meant that she now trains other new franchisees so her hard work is paying off in other areas. Being pro-active was also key and using social media when she couldn't get out and network in person as she was busy with her baby (Nicki has two young daughters, and they were the reason behind her becoming self-employed). Nicki seems to just work around everything that comes her way. I found her incredibly inspiring. What small thing could you change in your life or business for a greater impact? What isn't working for you right now that by making a small change would make a massive difference? It could be something as simple as spending 20 minutes outside in the fresh air before you start your day. Let me know below in the comments box what you'll do! Fundraising Total update: £268.88 Yippee! Target £2,500 – Can you help me reach my total by making a small donation? Every £1 helps! Thank YOU! Your day sounds like fun! I really perked up when I read that you don't have children, so you found it interesting. I don't have kids, and most of my friends here don't either, so I can't even remember the last time I was in contact with a child! Sounds like a creative day would be fun. And...I loved the salt dough recipe! Haven't seen that stuff in YEARS. Thanks for sharing your story! Hi Holly! Yes it was fun and same here I can't remember the last time I got to spend any time with young children so yes it was interesting! And I guess one of the benefits is that as we're not parents we can appreciate them in a different way - as in how spontaneous they are etc. If you know what I mean? 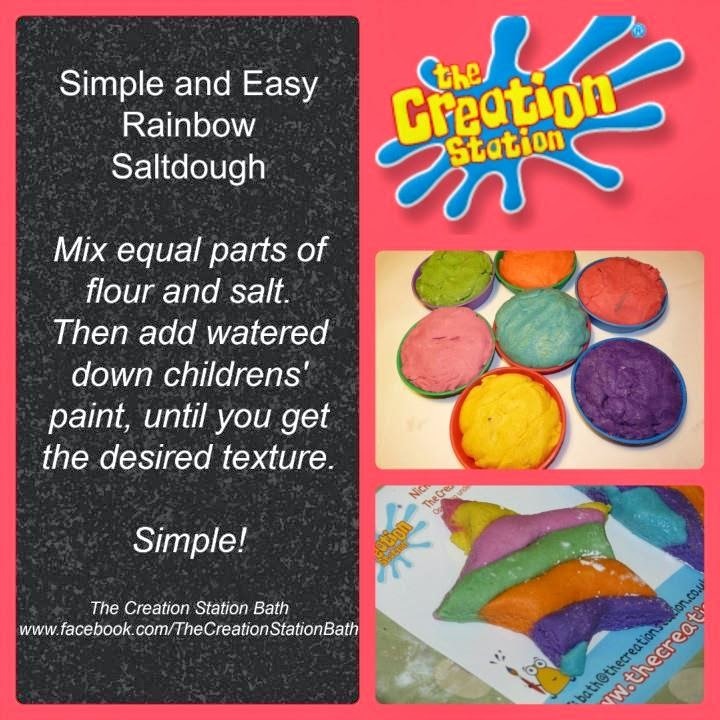 You can bake that salt dough too so it's not just for kids!